The VQ35DE engine is one of the most popular Nissan engines. It was developed to replace the VQ30DE engine (first generation of VQ series) in 2000. This engine was a winner of various awards as the best engine of the year. The engine got a forged crankshaft and connecting rods (their length is 144.2 mm), molybdenum coated pistons (compression height is 30.1 mm). It has variable valve timing system on intake camshaft only (CVTC). The main feature is what the engine has a reliable timing chain and no hydraulic lifters for more power efficiency. There are the second and third generations of the VQ35DE engine in the production history. They are different by intake manifold, channels in cylinder heads, reinforced engine block and softer valve springs. Also, they produce a varied range of power. Nissan developed the special version engine VQ35DE Rev up for Nissan 350Z 35th Anniversary Edition and some Infiniti G35 V35 models. It has CVTC exhaust camshaft also, short intake manifold. Rev limit is 7000 rpm, and the max power is 298 hp at 6400 rpm. The VQ series includes VQ20, VQ23, VQ25, VQ30, VQ37 and VQ40 engines also. 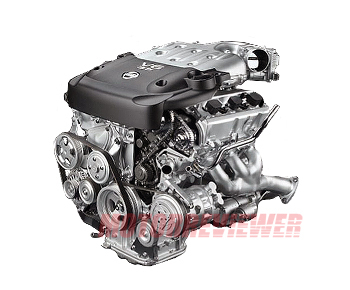 The manufacturer became replacing the VQ35DE engine with the new 3.7-liter VQ37VHR engine on their models since 2007. 1. High oil consumption. Catalysts of the VQ35DE are very sensitive to fuel quality. They produce ceramic dust, which damages the cylinders and piston rings. As a result, the engine has low compression, high fuel and oil consumption, and other dead engine symptoms. 2. Engine overheating. That is not a typical problem, but it has a place to be. Check the radiator condition and expansion tanks of the cooling system for any leaks.